When wedding bells are ringing, this cute pair of teddy bears earrings will complete your outfit for a bridal shower or wedding. The pattern includes a list of 5 recommended Delica bead colors and a full color chart. 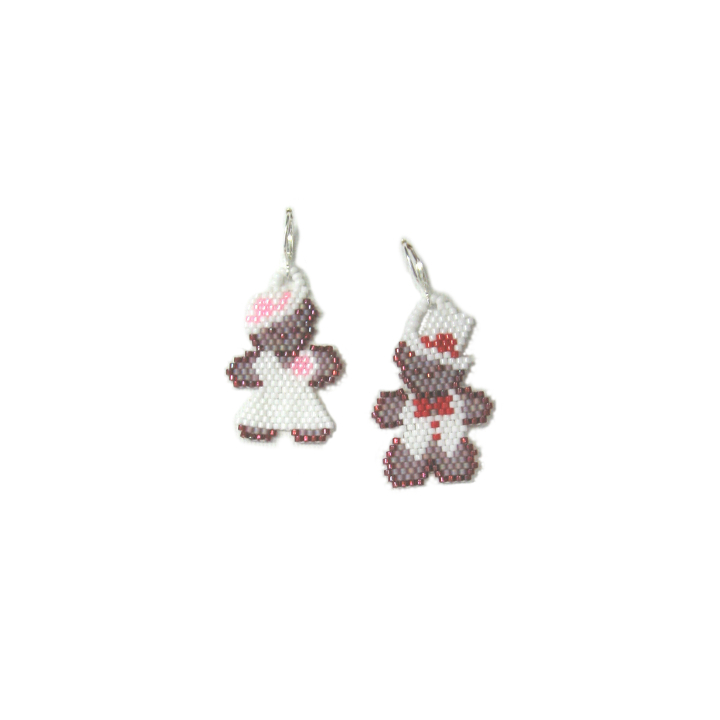 This pattern appeared in Issue 33 (Jan/Feb 2011) of Bead-Patterns the Magazine, titled Un-Bear-ably Cute Earrings. You can complete the set with A Beary Happy Valentine's Day Bracelet (item #00017022) and A Beary Happy Valentine's Day Pendant (item #00017021). The earrings can be beaded in either brick or peyote and requires knowledge of increasing and decreasing in the stitch used. Basic peyote or brick stitch instructions (including increasing and decreasing) are NOT included. 1.55" high and 1.1" wide.